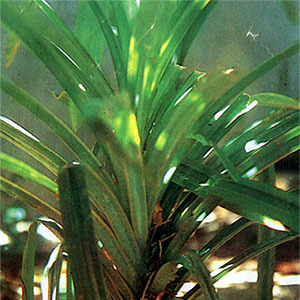 Pandan – Scientific name: Pandanus odoratissimus L.
Erect, branched small tree, growing 3-5 meters, the trunk bearing many prop roots. Leaves are spirally crowded toward the ends of the branches, linear lanceolate, slenderly long-acuminate, up to 1.5 meters long, 3-5 cm wide, the margrins and midrib armed with sharp spiny teeth pointing toward the apex of the leaf. The male inflorescence is fragrant, pendulous, up to 0.5 meter long. Fruit is solitary, pendulous, ellipsoid to globose-ellipsoid, about 20 cm long, composed of 50-75 obovoid, angular, fibrous and fleshy drupes, 4-6 cm long, narrow below and truncate at the apex. In thickets along seashores throughout the Philippines. Essential oil, alkaloids, glycosides and tannin. The prop roots possess diuretic properties. Diuretic: Take decoction of fresh or dried prop root as tea. Headache, arthritis, stomach spasms: Decoction of leaves. Poultice of fresh leaves mixed with oil also used for headaches. Culinary: An aromatic leaf used to perfume rice dishes. Wound healing: Pulverized dried leaves used to facilitate wound healing. Poultice of mash of cabbage of plant, mixed with salt and juice of Citrus microcarpa, for abscesses. Decoction of roots believed to have aphrodisiac and cardiotonic properties. Also used for arthritis and to prevent spontaneous abortion. Chewing the roots strengthens the gums. Decoction of roots combined with sap of banana plant for urethral injections for variety of urinary complaints. This entry was posted in List of Medicinal Plants in the Philippines and tagged pandan on March 24, 2009 by Pinoy Herbs. thanks 4 info that i get in this website. can pandan leaves be insect killers I just want to have a answer for my s.I.P. Sir i have readed the article . It is helful for my higher studies. Further i need some more details . please send me throgh mail. . . . . . .
tnx 2 information…, kaya ngayon ay makakagawa na ako sa investigatory project ko…, salamat.,! pwede ko po bang malaman yung mga chemical components ng pandan roots para maging effective ito for wound healing? kung may sagot na po kayo please e mail me at my e mail address..i need your answers a.s.a.p. it’s for my project proposal..
and please give me your name so that I can acknowledge you for your answer..
Nakatulong talaga ito sa herbal medicine planting namin! Thanks sa gumawa ng site na ito ^_^ . hi po….pwede q va malaman how can we make a perfume out of pandan leaves? alam mo?maganda idea yan.kasi yo’ng perfume na victoria”s secret meron sila scent ng alateris puno yun na ang bunga size ng coffee beans. thanks a lott for this info! nakatulong ng marami para sa project ko! !